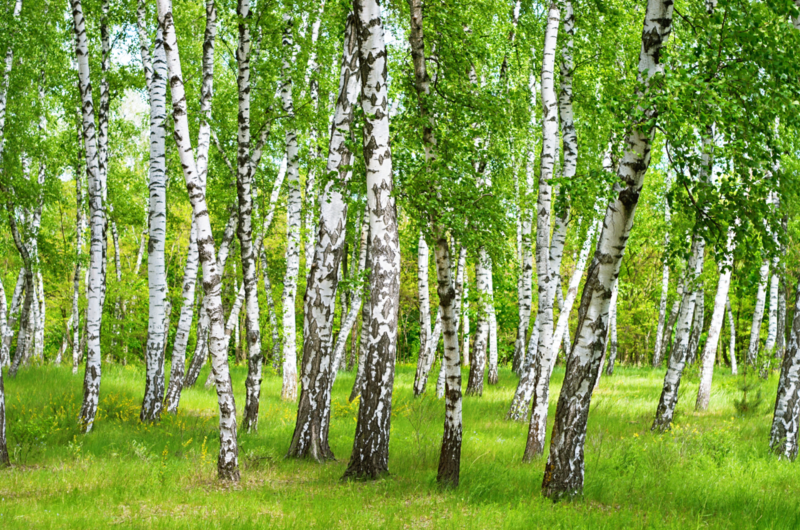 As a pioneer species, birch was one the first trees to populate the land after the last ice age. Deceptively hardy, its flexibility gives it strength. It is found as far north as the Arctic circle and is tolerant of the most acidic, exposed soils. Birch’s ability to withstand freezing is due to the fact that it can generate positive pressure in its roots forcing sap upwards and clearing out air pockets, thereby enabling the tree to recover from cavitation caused by freezing and thawing. There is no current explanation for this ability. The dappled light of its leaves creates life-giving conditions for many flowers: primroses, wood anemones, ransoms and bluebells as well as fly agaric mushrooms. It hosts great numbers of insects, exceeded only by oak. Typically a birch wood will be home to chaffinches, tree pipits, willow warblers, robins, woodcock, nightingales, redpolls and also woodpeckers which exploit birch’s excellent acoustic qualities in order to drum for a mate or advertise territorial claims. Humans also use the resonant nature of the wood to make drums and speaker cabinets, though not necessarily with the same aims in mind! Birch polypore, a bracket fungus unique to the birch tree is a food source for insects and assists in breaking down dead trees. It is able to carry a spark and strips of it may be used to sharpen knives as well as making perfect plasters. It contains immune enhancing compounds and is antiseptic, antibacterial and anti-inflammatory. Most amazingly birch polypore can potentiate betulinic acid from its host tree which has been shown in various studies to initiate apoptosis, or death of cancer cells. The sap of the birch tree is a valuable food source and can also be fermented to make wine or beer. Birch resin or tar was the first super glue. Mesolithic hunter gathers used it to glue arrows to their shafts 80,000 years ago. Birch is vital in helping to regenerate our woodland at Bwlch Corog, colonising open ground where the vegetation is sparse. Most exciting is the presence of a rare species of birch, Betula celtiberica, within the ancient woodland.